A chipped tooth may not seem like a big deal, but if left untreated, it can lead to severe dental damage. Fortunately, cosmetic dentistry treatments can improve the appearance of smiles affected by chipped teeth. Drs.Cristin Dowd and Ken Wu can repair the damage caused by chipped teeth while also restoring the appearance of the smile. To learn more about your treatment options, we invite you to schedule a consultation at our Woodinville, WA practice. Facial injury: Facial injuries, whether sports related or a general accident, are not always preventable, but they can lead to dental damage. However, if you do play sports, especially contact sports, wearing a custom-fitted mouth guard can help prevent damage. Expanding and contracting dental fillings: Dental fillings made of silver amalgam can contract and expand in reaction to changes between hot and cold foods and drinks. The regular expansion and contraction of metal fillings puts great stress on the treated tooth and may lead to dental chips or fractures over time. Using your teeth as tools: Using your teeth to open packages or cut tape, in other words using your teeth as tools, can be damaging to the teeth, increasing the risk of dental chips or fractures. Chewing on hard items or eating hard foods: Chewing on hard things like pen caps, fingernails, or ice cubes can cause dental chips. Likewise, eating extremely hard foods, like corn chips and corn nuts can also cause dental damage. 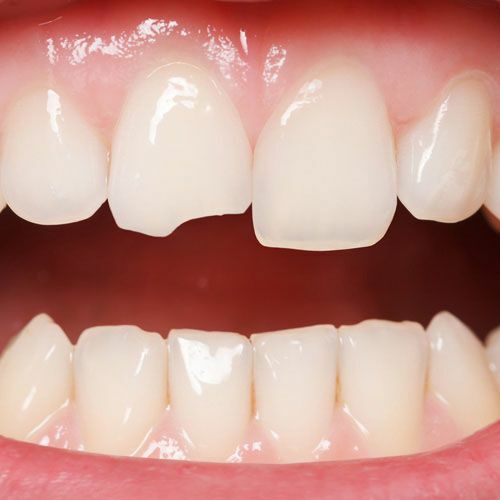 Chipped teeth are more than just an aesthetic dental problem. When a tooth becomes chipped, the protective outer layer of enamel also becomes damaged. Damaged enamel leaves the tooth vulnerable to decay as the inner structures are exposed to bacteria and plaque. If left untreated, a chipped tooth can lead to a painful root canal infection or, if decay becomes severe enough, even tooth loss. Treating a chipped tooth at the first signs of damage is key to protecting oral health and preventing further, more severe dental damage. Dental bonding: Dental bonding treatment works to mask dental flaws and minor damage, like small chips or fractures, using a putty-like resin. This soft resin is applied to the teeth and shaped to the desired size. It is then hardened and polished, restoring dental appearance and function. Porcelain veneers: Porcelain veneers are another popular treatment option for treating chipped teeth. Porcelain veneers are tooth-shaped restorations that cover the front surface of the teeth to hide flaws and treat minor damage. Onlays: Onlays, sometimes called “partial crowns,” are used to repair severe chips on the biting surface of the molars. Onlays are useful when damage is too severe for the above treatments but not so severe as to require a full crown. Dental crowns: Dental crowns are used when damage is severe. Dental crowns are tooth-shaped restorations that fit completely around a damaged tooth, restoring its shape, strength, appearance, and function. To find out which treatment is right for you or to discuss your personalized treatment plan, schedule a consultation with Drs. Dowd and Wu today.